“That which does not kill us makes us stronger” A terrible confession to start….. 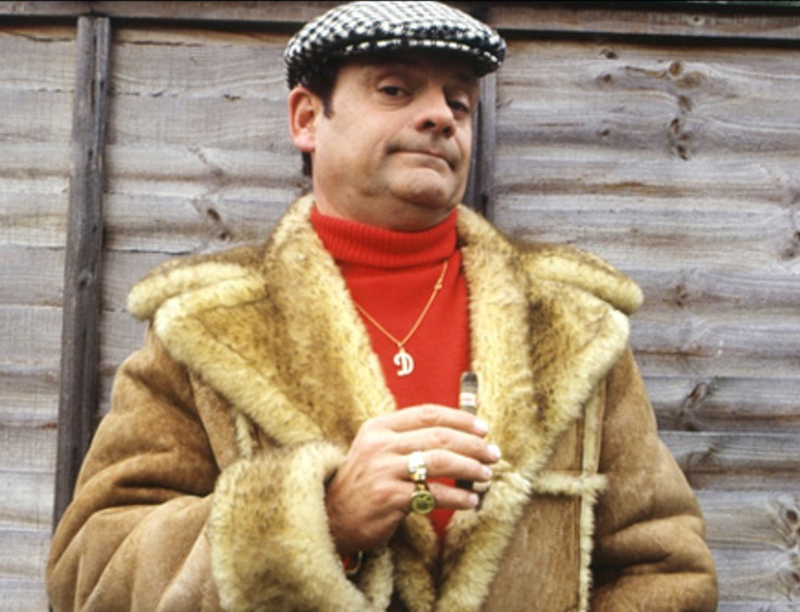 I thought it was Del Boy Trotter; Risk Management Advisor (“who dares wins”) and famous Peckham Philosopher who said this. Actually it was Friedrich Nietzsche, the famous German Philosopher (1844-1900), but you all knew that. We all know it makes sense….. some minor trauma, a failure or a setback (provided you learn some lessons from it) will improve things for the future; making us stronger, cleverer, more skilful, more resilient. Nietzsche coined the phrase in the late 1800’s and we’ve been quoting it ever since. However, there didn’t seem to be much empirical research to prove this was the case, until recently…. Buffalo University USA, Mark D. Seery. The 2010 research by Seery, Holman and Silver, ‘Whatever Does Not Kill Us: Cumulative Lifetime Adversity, Vulnerability and Resilience’ looked at the impact of negative events on the lives of almost 2400 people. If you have no trauma or difficulties in your life then you aren’t very well equipped to deal with something bad when it happens. If you have lots of difficulties (chronic exposure) you are in a pretty bad place full stop. More trauma or difficulty just adds to the misery. The right amount of bad stuff means you develop resilience that allows you to cope much better with any future difficulties. A sort of ‘Goldilocks Zone’ of bad stuff – not too much, not too little…..’just right’. All a bit like taking well-managed risks, learning from failure, beneficial accidents and Trojan Mice…. Trojan Mice ‘Safe to Fail’ Pilots Run in Parallel. What are Beneficial Accidents and Trojan Mice? Trojan Mice mice is a metaphor for an approach you can use when testing ideas in a complex situation. Explained as ‘safe to fail pilots’ by Dave Snowden; multiple test pilots that are run in parallel. ‘Safe to Fail’ means that any failure is fully ‘survivable’ and some pilots might actually be designed to fail. The whole point is that you test the situation and learn incredibly valuable things from the pilots and any failures. By conducting this process with multiple tests in parallel you are able to scale up what works and ‘kill off’ (I prefer the word ‘dampen’) what doesn’t. I have talked about this before in: 5 Differences Between Trojan Horses and Trojan Mice and What’s Eating the Trojan Mice. Recently Trojan Mice were part of a workshop I was running on ‘Well Managed Risks’ at the Welsh Public Services Summer School (#SSWales on Twitter) which, by the way was inspiring and an incredible opportunity to learn and share ideas. Whilst I was explaining the benefits of ‘safe to fail’ Trojan Mice and ‘survivable failure’ one of the delegates shared the concept of ‘Beneficial Accidents’……. the same sort of thing, accidents where you learn a huge amount, but it doesn’t actually do you any significant harm. The area she worked in was Children’s Play, and we all quickly started sharing stories of falling out to trees and other escapades that taught us so much as children. It’s obvious really, but why isn’t the approach widespread in the world of work? The lady who shared the idea of Beneficial Accidents said it was a phrase that had been used by people from the Royal Society for the Prevention of Accidents (RoSPA), and also shared a document from the Health and Safety Executive (HSE) with me (thank you Cathryn). Children’s Play and Leisure – Promoting a Balanced Approach from the HSE is well worth reading in you are at interested in how to approach learning from failure and well-managed risk taking. 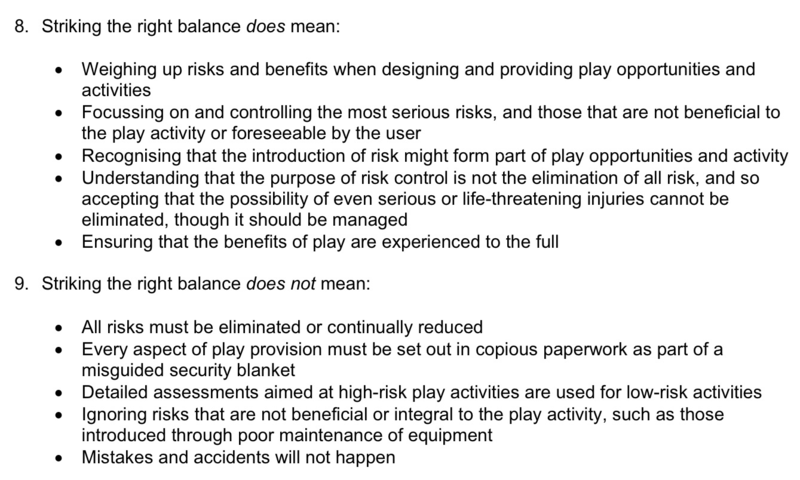 Just have a look at this section on ‘striking the right balance’ from the document – if you replaced the ‘play’ references with ‘corporate’ I think it would work quite nicely as a guide to what ‘well managed risks’ look like. Mistakes and Accidents WILL Happen! The ‘Beneficial Accidents’ approach and HSE guidance on children’s play could be used for approaching ‘Well Managed Risks’ is the corporate world. 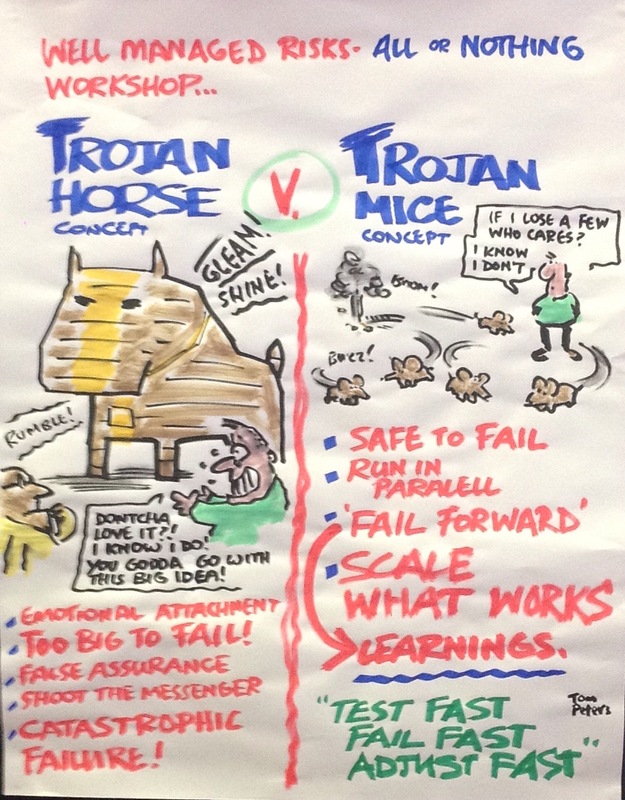 Here is the full graphic of Trojan Horse v Trojan Mice from Summer School. Thanks to Paul Richardson of apagraphicfaciltation.com for this. Really interesting as always Chris. The ‘Goldilocks Zone’ of bad stuff really resonates with a load of conversations I’ve been having about resilience. ‘Goldilocks Zone’ a big part of building resilience and learning from failure. A bit like the porridge though, a bit challenging to get it just right. Apart from the Three Bears story it comes from astrophysics I think….. Looking forward to it appearing in the business world soon. ← Corporate Reporting. Doing a Jigsaw Puzzle Without the Box Lid?